Announcing...the Dakota Shawl Collar Dress Sewalong! What can I say people, this has been a long time coming! Ever since Rachel introduced me to Named patterns back in August I was smitten and an idea to co-host our first ever sewalong was hatched! Getting on like a house on fire and our mutual appreciation of each other's styles made it seem like a no-brainer. We settled on the gorgeous Dakota Shawl Collar Dress, but our idea was somewhat hampered by my house move and Rachel's travels. We were determined to make this happen though and we're so excited to finally be announcing it! We know that despite loving Named's extensive pattern collection some of you have been a little worried about the rather sparse and picture-less instructions. Having already made the Laurie Striped Tee I can tell you it's not so hard really, so Rachel, myself and some wonderful guest bloggers (including Saara and Laura from Named, Vicki from Minerva Crafts, Lauren from Lladybird and Alana from Lazy Stitching) will demystify the process for you by sewing up the Dakota Dress together! We've got a pretty comprehensive schedule lined up, so we hope you can join us. Even if you're an experienced stitcher you're welcome along for the ride...it's going to be fun! 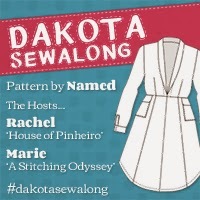 We'll be using #dakotasewalong on Twitter to answer any questions and for general sewalong-related banter - @HouseOFPinheiro & @StitchOdyssey. We've set up a Flickr Group that you can share your pictures on and help each other with any fitting woes or difficulties. Obviously Rachel and I will try our best to keep on top of any questions, but at times when we're not available this will be a good alternative. We'll also be sharing inspiration, progress and the sewalong posts on Pinterest. So, what are you waiting for? Grab a button and let us know if you're in! This looks like so much fun! Being a bit stupid though, does it come with a pattern piece to fill in the slit to the navel shawl collar or is that left to us as to what to wear with it? This is a very good question! The pattern is just for the dress and you have to wear something underneath to preserve your modesty ;o) I hope you'll join us anyway! How cool! I'm so excited to see these dresses-- this pattern really intrigues me! Not sure I'll have the time to join in, but I can't wait to see what everyone makes! Shame you can't join, but totally understand! Hope you're enjoying your patternmaking course! This is exciting! Unfortunately I won't be able to join in due to heavy deadlines and a holiday next month but I'll be cheering everyone on from the side lines. Thanks for the support Claire! Oooo...I AM tempted..but. I feel like I need to see some more versions on the internet before I can decide if this dress is for me or not. I'll be watching the sewalong with interest! Will definitely be following, cheering you all along and bookmarking for when I get a chance to make this pattern. Unfortunately I've committed to a big non-sewing project for November but I'm really looking forwards to seeing what everyone makes. Hi Claire, so pleased you want to join us! Basically, if you follow mine and Rachel's blog we will literally guide you through sewing the pattern. 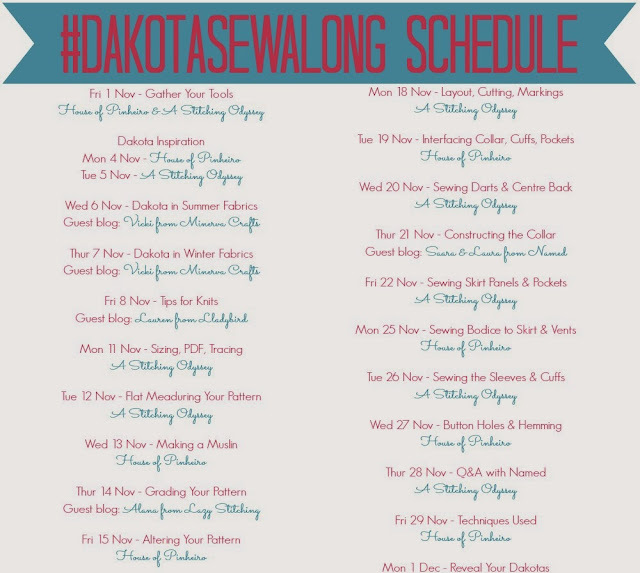 The schedule is above and today we've just published a blog about what tools you'll need (http://www.astitchingodyssey.com/2013/11/dakota-sewalong-gather-your-tools.html). Next week we'll be sharing inspiration posts and tips about suitable fabrics. The week after we will take you through assembling your PDF pattern, adjusting your pattern to fit you etc and then we start sewing. Rachel and I will be taking readers through each sewing step with detailed posts and photos. I hope this helps, but do let me know if you have any more questions! Thank you very much for your very helpful instructions. They gave me a Dakota Dress for christmas.